Images courtesy College of DuPage Meteorology (top-left, bottom-right), SPC/NOAA (top-right), HamWeather (bottom-left). A Flood Watch, Wind Advisory, and Coastal Flood Advisory are in effect for parts of New Jersey. Friday was a disgusting, wet day for New Jersey with rainfall totals over 4 inches in spots. Another round of heavy rain drenched the Garden State on Tuesday, with over an inch of rainfall across must of the state. April showers? Ha! Try April downpours. While it's not unusual to see healthy rainfall in April, it is unusual to have three distinct storm systems in the span of just a week. In fact, the last time this occurred at Newark Airport was July-August 2009 (thanks largely in part to the effects of Hurricane Bill). The last time this milestone occurred in the springtime in New Jersey? April 1984. It is quite extraordinary that we've been stuck in such a constant stream of strong storm systems. And therefore no wonder we're talking once again about flooding and severe weather from Thursday's system. Live radar. Green=rain, yellow/red=heavy rain. A low pressure system will ride up the Atlantic coast on Thursday, spreading bands of precipitation from south to north throughout the day. (I'm willing to call this a "nor'easter-ish" system given the storm track.) Also coming into play will be a second strong low passing across the Great Lakes. This potent combination of atmospheric moisture and energy is a perfect setup for stormy weather. Stormy is an understatement for residents from Illinois to Florida, who got slammed with 70+ mph damaging winds, tea cup sized hail, and numerous tornadoes. 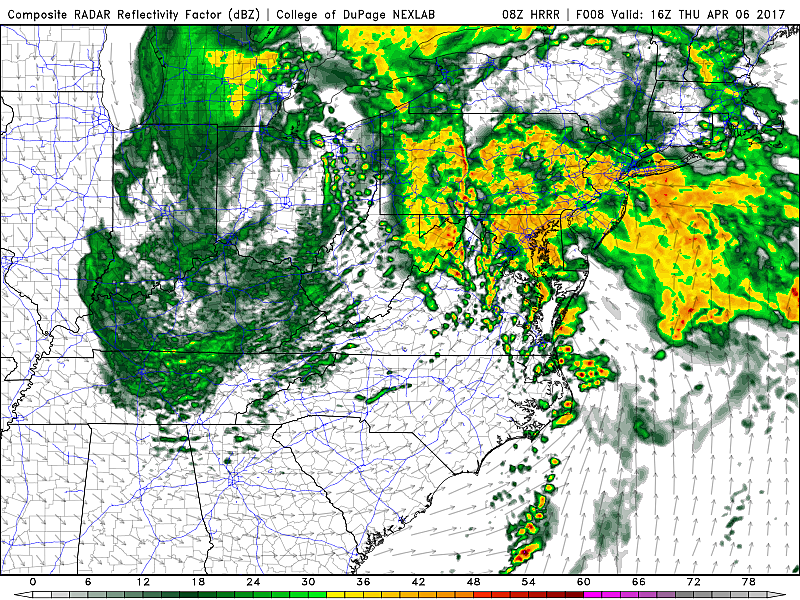 While the forecast severe parameters look a bit milder for New Jersey for Thursday's storms, it's still going to be vital to stay vigilant and weather-aware. As of this writing, showers and pockets of rain have begun passing over New Jersey. So far, rainfall intensity has been moderate at the highest, with no significant lightning or wind threats. As the day presses on (especially after sunrise), heavier rain and embedded thunderstorms will be likely statewide. While it may not rain all day in any given location, I think it's going to be a wet, stormy, and downright nasty weather day. Rainfall should peak from mid-morning through mid-afternoon. If I had to pick a time for the heaviest, most widespread rain, I'd say Noon. Our atmosphere will calm down significantly from late afternoon through Thursday evening. While I wouldn't rule out a few showers Thursday evening, we will see a period of mainly dry weather across New Jersey. Our primary concern from Thursday's rain will be the potential for flash and river flooding. As I have talked about so much in the past week, our ground is already thoroughly saturated. Meanwhile, rivers, streams, and creeks are also running high — even at or above flood stage. According to the Mid-Atlantic River Forecast Center, parts of the Millstone River and Passaic River are already in "Minor Flood". That's before a drop of rain has fallen there on Thursday. Watches and advisories from the National Weather Service. Most of the state falls under a Flood Watch, with a Wind Advisory in effect along the coast. So it's not going to take much to see large, deep puddles on roadways and waterways overflowing their banks a bit. While I don't expect any catastrophic flooding, some road closures and property damage will be possible (if not likely). Remember to never attempt to walk, drive, or swim through flooded areas. A Flood Watch is in effect for all or part of 17 NJ counties from 8 a.m. Thursday through Friday afternoon: Bergen, northwestern Burlington, Camden, Essex, Gloucester, Hudson, Hunterdon, Mercer, Middlesex, western Monmouth, Morris, Passaic, Salem, Somerset, Sussex, Union, and Warren. Meanwhile, unlike our previous two bouts of heavy rain, marginal instability and shear will likely allow for elevated thunderstorms on Thursday. Some of those storms could be on the strong side, which presents a new slate of potential weather issues. 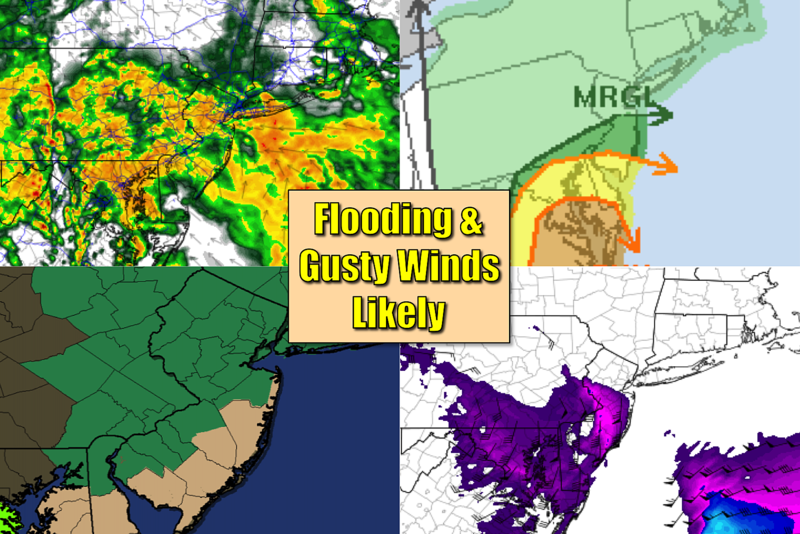 Other than flooding, gusty wind will be the biggest storm danger of the day. Gusts over 50 mph are expected from the inflow and outflow of storms. In addition, the pressure gradient will probably keep winds on the brisk side even far away from any thunderstorms. It's a good excuse to secure your garbage cans and patio furniture. A Wind Advisory has been issued for all of part of 6 coastal NJ counties from 8 a.m. to 5 p.m. Thursday: Atlantic, southeastern Burlington, Cape May, Cumberland, eastern Monmouth, and Ocean. Thursday's severe weather outlook from the Storm Prediction Center, putting part of New Jersey in the "Slight Risk" category. The Storm Prediction Center has put the southern two-thirds of New Jersey in a "Marginal Risk" and far South Jersey in a "Slight Risk" for severe weather Thursday. That's the lowest and 2nd lowest category of severe risk, respectively. While wind will be the primary concern, hail and a tornado can't be completely ruled out. Especially in the "juicier" air of SW NJ. Any time a potent area of low pressure with strong easterly winds passes by the Jersey Shore, we have to look carefully at the coastal flooding picture. About a foot to a foot-and-a-half of water rise (surge) is expected. Not a big deal. But it could be enough to push some water inland over particularly sensitive areas at the time of high tide. The highest tide cycle will be Thursday evening. The biggest threat of this minimal to minor flooding will be from Monmouth County north. A Coastal Flood Advisory has been issued for eastern Essex, Hudson, and eastern Union counties from 5 p.m. to 8 p.m. Thursday. There could be a few showers around for Thursday night. Friday's temperatures will be held at bay in the 50s, thanks to mostly cloudy skies and a chilly brisk wind. We'll taste this storm system's last licks of light showers Friday afternoon and evening. Furthermore, if temperatures are cold enough, there could be a few snowflakes flying around late Friday, especially in NW NJ! Big improvements are coming for the weekend, as we begin a stretch of dry, pleasant weather. Saturday will still be a bit windy and cool, with highs in the mid to upper 50s. Sunday looks fantastic, as temperatures bounce into the mid 60s with abundant sunshine. High temperatures for Monday and Tuesday should spike above 70 degrees across most of the state. I can't wait! Our next rain chance and potential cooldown will be late Tuesday into Wednesday. Get South Jersey news and information e-mailed to you every week. 2019 WPG Talk Radio 104.1FM, Townsquare Media, Inc. All rights reserved.